If you have heard of the Great Sphinx before, you might hold an image of the great construction of a winged-lioness with a human female’s head in Giza, Egypt, near the pyramid of Cheops. This is the most widespread representation of this mystical creature, though the word ‘Sphinx’ does not actually stem from Egyptian origins, but rather from the Greek language, signifying a ‘living statue’ combining elements of Egyptian or Greek royalty with their animal counterparts. A Sphinx does not have to be part lion and part human as is the Great Sphinx, but instead be any animal fused with a King (Pharaoh), another member of his family, or Deity. There is variation in the role of the Sphinx between Egyptian and Greek Culture. 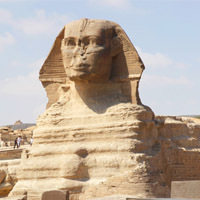 The Egyptian Sphinx, generally a male with the exception of the Great Sphinx, is said to represent power through a benign rule over the constituents within his or her domain. This contrasts with the Greek Sphinx, who is usually female, and is antagonistic in nature. In Legend, this Sphinx will not let anyone pass her without answering her riddle correctly. What goes on four legs, on two, and then three, but the more legs it goes on, the weaker it be? Whether you do not know the answer, are already aware of the answer, or have figured it out, there is great depth to this riddle beyond its surface. The Riddle of the Sphinx has profound implications in certain paths to Spirituality, including Practitioners of Magick and followers of the Kabbalah. Upon answering incorrectly, the Sphinx would either not let the individual proceed, and strangling and devouring the person if they attempted to pass despite their wrong answer. But once Oedipus had pondered and solved the riddle correctly, the Sphinx allegedly devoured herself, after having unsuccessfully tried to make Oedipus love her. Why? Because King Oedipus has answered the riddle of life, and the guardian of this secret is no longer necessary. There are various interpretations concerning this moment in which the Sphinx destroys herself. Some scholars take a strictly historical vantage, and state that this point was a time of transition where the old Egyptian deities lost their power to those of Ancient Greece. In other words, around the time of Sophocles’ writing, the Greek Civilization was on the rise whereas the Egyptian Civilization was experiencing great turmoil and seemed to be rapidly declining. The Greek city-states, who had once been under the influence of the Egyptians, had their own spiritual ideas, and needed a way for them to surface. Symbolically, the destruction of the Sphinx represents this change in regime – where the Egyptian myths will become the past and the Greek ideology the present. Others hold a more mystical viewpoint surrounding the Riddle of the Sphinx. Essentially, in a world of humans and their emotions, the Sphinx was a mammoth, emotionless, stoic hybrid that stood in their paths, preventing them from reaching their goal. Many had tried to pass, unsuccessfully, as they were unable to overcome this great obstacle. Upon a seemingly simple question, these individuals were unable to clear their minds properly, and this insufficiency had cost them their lives. But Oedipus was able to achieve a high level of consciousness through the decision-making process, and was therefore able to achieve his goal. He was able to solve the mystery of life. After doing so, Oedipus was able to break down the barrier and transcend from the physical realm to the spiritual realm. This is what many Practitioners, Mystics, and others alike attempt to accomplish through their work – to break down this barrier of mental blockage and human emotion to reach a heightened state. THIS RIDLE IS VERY DEEP TO UNDERSTAND TO COMMON PEOPLE BUT I WILL TRY TO INTERPREAT IT.,A CHILD GOES ON FOUR LEGS,WHEN GROWN UP SHE WALK ON TWO LEGS ,IN OLD AGE SHE WALK WITH STICK.THIS IS PROBLEM SOLVING.